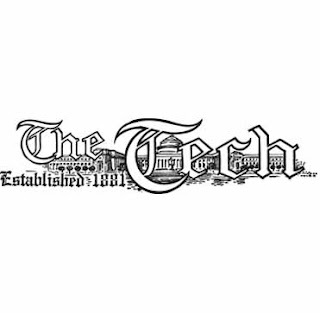 The Physics Groupie Blog: MIT's Newspaper "The Tech"
I have a very serious fascination with MIT. There are some deep-seated personal reasons for this, but we’ll stick to the science here. The Massachusetts Institute of Technology (or the “Institute” as it is affectionately called) represents established East Coast science so for that reason alone, I’m drawn to MIT. Besides I love New England in general and Boston in particular. Even though I’m a native Angelino, I root for all the New England teams, especially the Boston Red Sox. I should have been born on the East Coast. Cambridge, Mass. is similar in nature to other pure college towns, but Cambridge is academics on steroids, being home to two world-class universities, MIT and Harvard. This is very rare. You can smell the brain-power just walking along Massachusetts Avenue, and approaching MIT from the Charles River Bridge is like entering into a high-powered academic zone. To say it is stimulating for a physics groupie like me is an understatement. I chose to subscribe to the MIT student newspaper called “The Tech” so I could stay in tune with what’s going on at MIT. My copies arrive here in Los Angeles a few weeks after the publication date, but no matter, I still find the news items interesting. I believe The Tech to be a very good student newspaper, definitely one of the best for a math and science school. Having read the Caltech newspaper for years, I can safely say that MIT’s is better. The Tech has a number of interesting sections. One of my favorites is the “Campus Life” section with its “Talk Nerdy to Me” column. I also like the “Police Log” section with reports of various crimes committed in the area (for example, one of the MIT police officers was arrested for drug trafficking). The Tech also has a strong comics page that include several Dilbert and Doonesbury comics stacked together, not to mention “P.h.D.” comics (Piled Higher and Deeply). I look forward to reading the letters to the editor to get a reflection of political leanings on campus. Finally, the sports page is engrossing to me because I can read about sports unknown here on the West Coast like lacrosse. The Tech can be freely accessed online and downloaded in PDF format from The Tech’s website at: http://tech.mit.edu/.